There was supposed to be 6 of us, but one bailed due to work and one came earlier than expected when I went out for an errand, so she went off to do her own errand and thus we started with 4. How weird is that? Anyway, I was secretly joyous about having 4 and 5 rather than 6. Ssssh. Tell no one. First game was Origin. It's basically a quick game of stuff collection (it would be a bit of a stretch to call it set collection) and hidden objectives. I played this at Eric's and liked it enough to buy it off him. It plays quick and has a very friendly racing vibe to it. 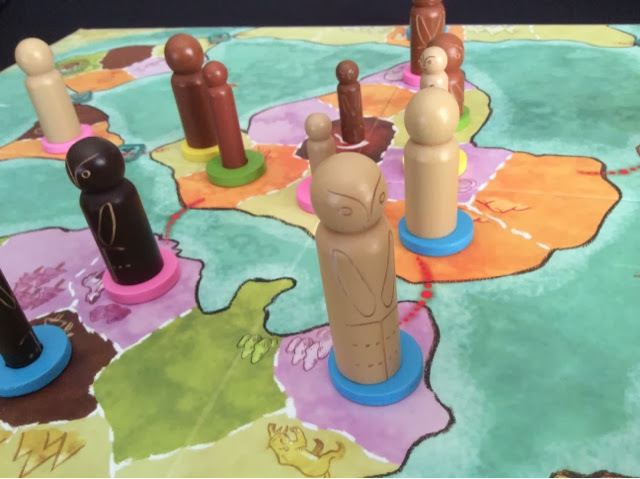 Each turn you can expand, or move your tribe, or swap places with others, all this so that you can collect point tokens on the board and tech tokens to use cards or for greater points scoring. There are cards that let you use constant or one time abilities and also objectives for you to complete. Each turn is basically about how you can increase your points or put yourself in a position to finish objective cards or perhaps some points denial. Nothing really ground breaking or different, but for some strange reason I am quite taken by it. I think it's cos it's newbie friendly, yet not something that is extremely boring for me to not want to play. We all enjoyed it and I got thoroughly beaten. Came in third and I was actually trying. Hmmm. Our fifth and final player came so I took out Eric's copy of Super Rhino. Anyway, we did really well despite the presence of wind through my side door. It got to about ten stories high and the girl who brought it all crumbling down was showing signs of Parkinson's throughout (no offense to those who actually do have it). She was a wreck. Haha. She actually jumped up and down when she nearly dropped rhino on the card instead of placing it. Take a chill pill girl. We would have definitely played it again if there weren't so many new games to explore. I can see this coming back to the table the next time they come over. 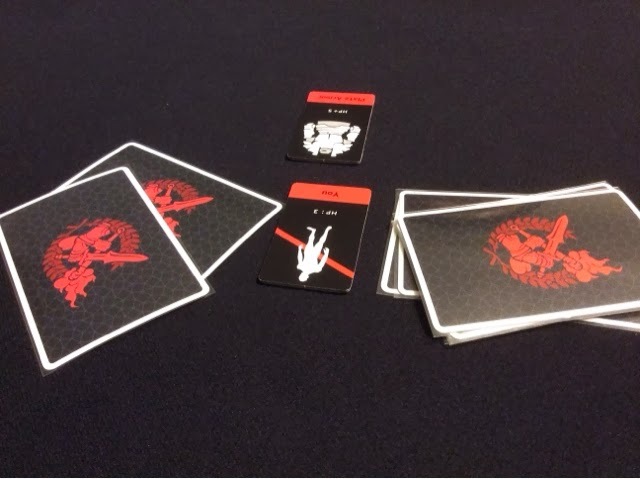 I played a game that was sent to me for an opinion and perhaps a review if I can get enough plays of it. It's a push your luck style game of bank looting. I didn't get any photos in cos I was trying to get a good feel of the game. Initial opinions is good from my newbie friends, they liked the theme and the simplicity but they did say it felt longer than it should have been (I concur). I on the other hand feel some small issues with it, perhaps too much take that each round apwhcih cause a delay in the game or some rather frustrating moments. Would love to give it a go again and see if it gets better with experience. It's not a bad game, but could use some polish. Keep a lookout for further opinions and perhaps a preview/review! Next up was a game of dungeon guilds. Nothing screams fun like the presence of chibi girls! Haha. Some people might be turned off by the art style but it's gone over fine with all the people I have played it with. Not sure if it's cos we are Asians? 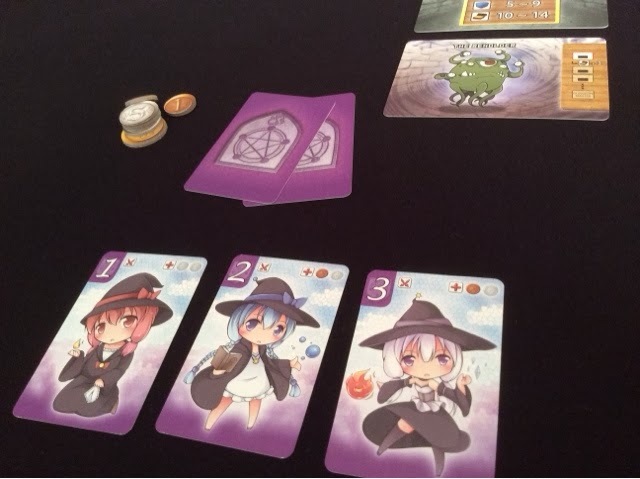 Anyway, dungeon guilds is a push your luck + negotiation game. Players try to amass the largest amount of money by looting rooms in a dungeon. Teamwork is required to ensure the successful slaying of the monsters and also to perhaps throw a wench into the plans of others. The game doesn't outstay it's welcome and provides much laughter in the process. Keep a lookout for a review soon! Up next was Sushi Go! Sushi go! is a really fun drafting and set collection game. 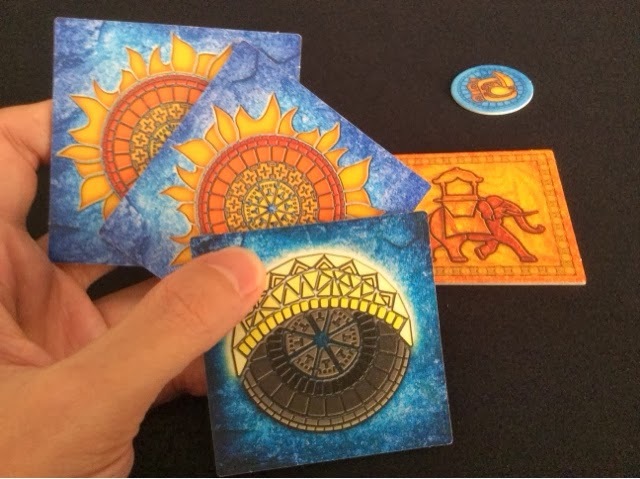 The art is beautiful and the mechanics very seamless and easy to understand. The game was up and done before we all knew it. 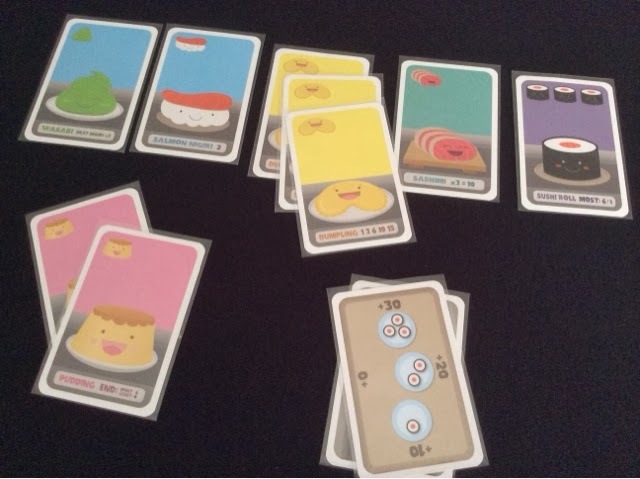 We played using the variant I introduce for all my games of Sushi go! ( you can find it in one of my fix'it posts on our website ). In Sushi go!, players draft ( take one card, pass the rest, rinse and repeat ) a certain number of cards depending on the player count. Through this process of drafting players are trying to collect sets that score points in a different number of ways. Some require you to collect pairs or sets of 3s, while others want you to simply have more than everyone else on the table. You do this for 3 rounds, and the player with the most points thereafter is the winner. But yeah, I think it's just my love affair with set collection in games. I see, I want, I take! Thank you very much. Well, a poor last round ( above ), cost me the game. Scores were surprisingly tight at 32, 31, 30 and 27. I started off well with a win in turn 1, but I couldn't captialize on it and didn't take home the win. This went down well with all and my normally risk adverse friend was surprisingly quite a high bidder. Haha. She didn't win but I was genuinely surprised by how she opened up to the dynamics of the game. The remaining 4 of us weren't hungry so we jumped straight into little prince. I managed to net the win regardless, a focus on stars and rose gave me a comfortable win. I managed to juggle the rose quite well I would say, I have always found it difficult but the right tiles at the right time helped me to manipulate my game state enough to leave me standing with but a single rose. Now, who can I give it to? Haha. 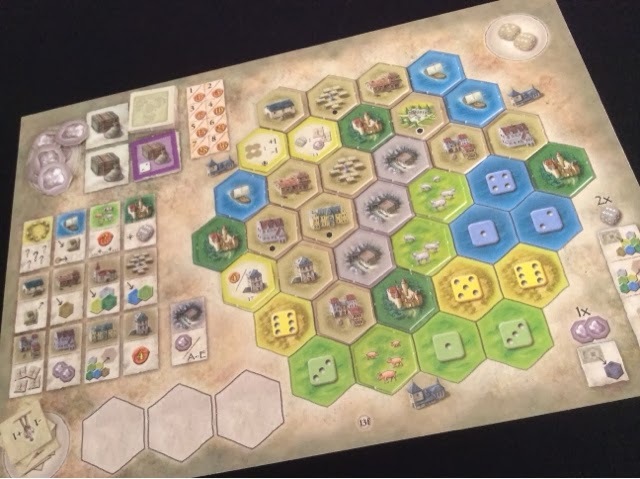 Well, with the ideal compliment of 4 players, I decided to see how far I could take things and whipped out the castles of burgundy. I was very hesitant initially but decided, heck, the worst that could happen is that we stop after round A. 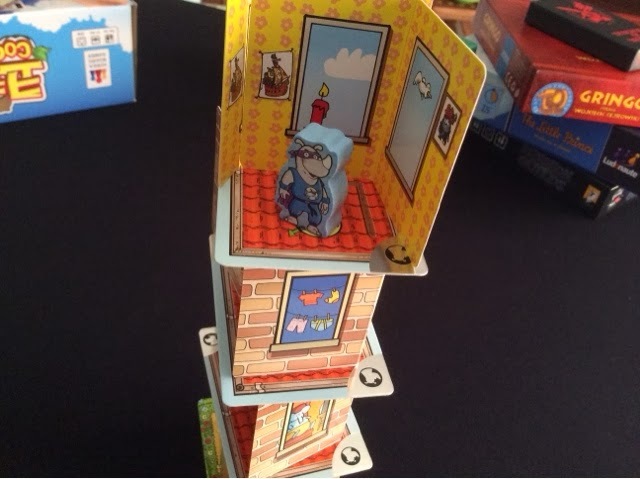 The rules explanation went pretty well, managed to get them to follow the iconography for the buildings and remember the flow of the game. So we dove head in! So, it was the one experienced player - me, versus 3 absolute newbies to medium weight euro games. A stroll in the park right? Like, what could possibly go wrong? EVERYTHING. I had my behind handed to me on a silver hexagonal platter. Here I am, being cocky thinking I could afford to go last each turn, build up at my leisurely pace since they probably wouldn't know what they were doing. I was so mistaken. Granted, I did help them with their initial turns for round A, and pushed them to rethink certain actions they wanted to take and make them reconsider another better option, but most of the work was their own plans and execution. 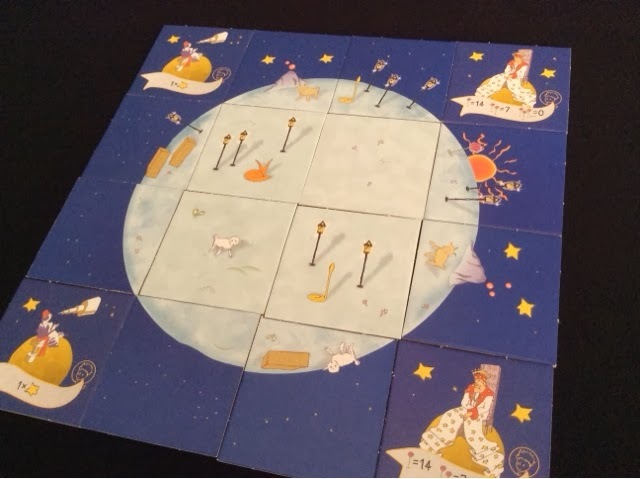 I didn't managed to score any points until the end of round A. I had 3 wasted turns discarding tiles I didn't want ( due to poor decision making ), and I chose a poor path of execution for my own player board ( see above ). It was my most disastrous play of castles ever. The horrors! I didn't even end up second, I was a distant third. Winner had 269, second place 225, myself 220, and the last player 190. I was soooo far away. By the start of round D I knew she had the game in the bag and I was playing for pittance. After that thoroughly long & mind numbing ( for them ) session of castles, the ladies requested for a mindless game. Well, that opened the door for none other than Coconuts! 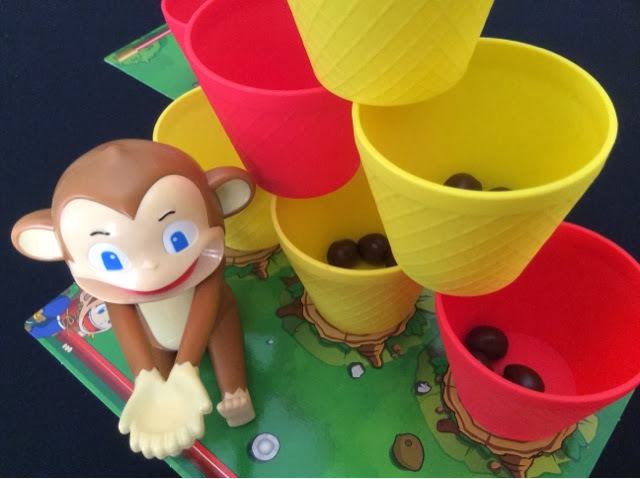 We played 2 games of this and for those who don't know what it is, its a simple dexterity game where each player uses a Monkey Catapult to shoot coconuts into cups. Yes, you can't make this up. Out first game was surprisingly long, we were absolutely horrible at chucking nuts. It ended when all the coconuts were gone and I lost with my last coconut filled cup getting stolen at the last shot. The second game went much faster, possibly due to our "warm up" game. I nailed the win with the red cup and yellow cup combo. All hail your new monkey king! I'm still loving Coconuts a lot, but am starting to feel that the special cards are rather pointless. We seldom use them in the flurry of the shooting and they are mostly reserved to stop the leader from trying to win the game. So it seems like its just there to prolong the game and make the leader suffer while giving others a chance to steal cups from him/her. I guess its a good catchup mechanism, but for such a silly and chaotic game, I think prolonging it feels redundant when you can just play another round. I might play without the cards in the future. Will give it some thought. The last game for the day was a double session of Dungeon of Mandom. We actually had another delve ( pictured above ) with no weapons but just the body armor. That was a tough tough decision to make. The delve was successful in the end but that was easily the most interesting round for the day. Its amazing how low the equipped items can go but yet everyone is still strongly considering the notion of going in. I've played this game a heck of a lot of times already, but I still can't get over how much I enjoy this little gem. It's constantly in a battle with Gringo for the top spot ( or maybe second spot ) on my list of best bluffing games. Who will emerge victorious? Only time will tell. Well, that was my first weekend of games with Eric not around. How'd you get a copy of Dungeon guilds? Wow! 9 hours of gaming, how I wish I can afford that kind of a luxury (without being brain dead at the end of it)! Well done! My friends were drained by then but i think its because they are not used to hours upon hours of gaming. Haha. Wow ........ this must be seriously quite a fun fill day! ........ But I think you will probably tired out all the new players with Trajan ......... Lengendary is probably a better choice.